Bundy is representing himself in a federal trial that began last week in Las Vegas related to the 2014 armed standoff with the Bureau of Land Management and National Park Service near Bunkerville, Nevada. In response to the confrontation, the government abandoned their attempt to gather Bundy cattle that had been illegally grazing public land for decades. Ryan Bundy, as well as his father Cliven, brother Ammon, and self-styled militiaman from Montana Ryan Payne, face charges that could put them in prison for decades, ranging from threatening federal officers to obstructing justice. Two men who came to the Bundys’ aid at the standoff, Todd Engel and Gregory Burleson, were convicted for related charges earlier this year; several other supporters charged in the indictment have reached plea agreements, and two have been acquitted. The current trial is expected to last four months. Ryan Bundy, center, walks out of federal court with his wife, Angela Bundy, in Las Vegas. He is accused of leading an armed standoff in 2014 in a cattle grazing dispute and is representing himself in the trial. As Ryan Bundy explained himself to the jury, he described a vision of an American West born in the mid-19th century, of rugged individualists who created a society not with the help of, but in spite of, the federal government. His statements portend a trial that will pit clashing visions of the region against each other. And as Bundy unspools his family’s beliefs for the jury, questions are mounting in court over how forthcoming the government has been with evidence related to the alleged crime. Ryan Bundy’s statements focused on the federal government’s involvement in Western land management and echoed long-standing movements to wrest public lands from federal control. “(Prosecutors) want to say the government owns the land,” he said. “Right there is the crux of the issue.” In several Western states, lawmakers have pushed to transfer federal land to state control — a movement known as the Sagebrush Rebellion that began in the 1970s, which has reemerged in recent years. In Bundy’s West, true public land would be owned by the state of Nevada, not the United States. The Bundys say the 2014 standoff was a peaceful protest in response to the federal government trying to control land that doesn’t belong to them. On Thursday, Cliven Bundy’s lawyer, Bret Whipple, doubled down on Ryan Bundy’s interpretation of grazing permits as inalienable rights. Whipple stood in the middle of the courtroom, holding pages of the Taylor Grazing Act, which Congress passed in 1934 to set up the public-lands grazing permit system that exists today. He handed the pages to a witness on the stand, Mary Jo Rugwell, the former district manager of the Southern Nevada BLM office. Didn’t the Act include “grazing rights?” Whipple asked Rugwell. “It acknowledged that there were grazing privileges,” she answered. It’s not clear what text in particular Whipple was pointing to, since the closest the Act comes to describing grazing as a right is in a section about rights of way, which scholars say is unrelated. And yet Whipple’s line of questioning helped trace a picture of the Bundys’ West for jurors — in which the federal government has no authority to either own land, or manage grazing permits as it sees fit. 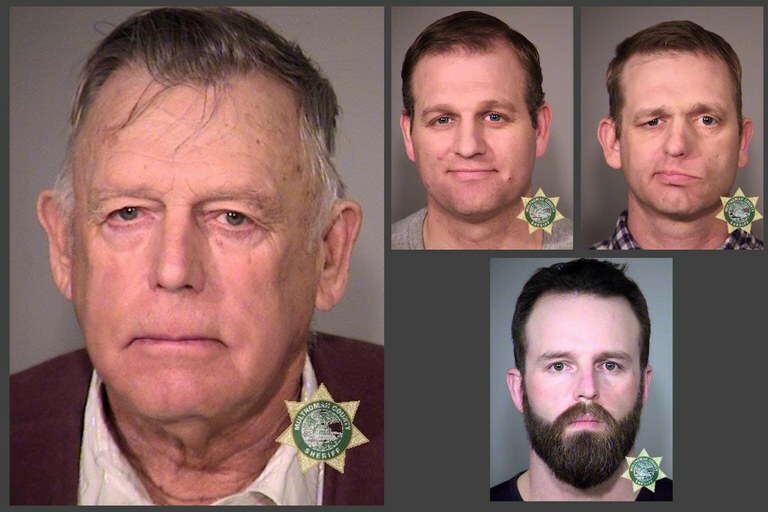 Defendants Cliven Bundy, Ammon Bundy, Ryan Bundy and Ryan Payne. If the Bundys win this case, it could also reinforce an idea of the West as a place where people who disagree with federal agencies’ land management can gather a crowd, including families with kids but also armed militia, and get their way. 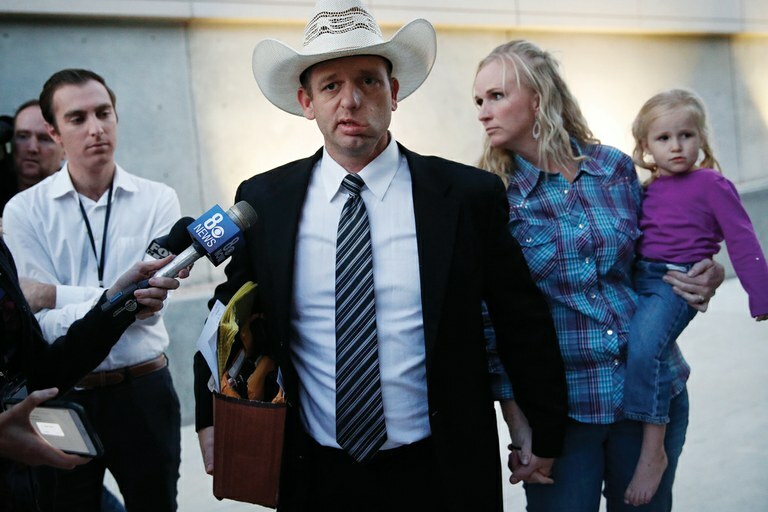 U.S. prosecutors presented a starkly different reality than the Bundys’. In opening arguments last week, they detailed a strict system of law and order. “Our American judicial system is comprised of the courts,” said Steven Myhre, acting U.S. attorney for the District of Nevada. “That’s how we maintain peace … If the (court) order is not followed, you can expect law enforcement will get involved.” Federal court orders in 1998 and 2013 required Cliven Bundy to remove his cattle from public land; he ignored them. But the prosecutors also grappled with allegations that they have withheld evidence related to government conduct during the standoff. It recently surfaced that the government used a surveillance camera to monitor the Bundy residence and surrounding areas, and may have had an FBI SWAT team on hand during the impoundment. The government first told the court it did not acquire recordings of defendants speaking with their attorneys from jail. Later, they revealed the prosecution did in fact have recordings of a co-defendant. (That defendant, Blaine Cooper of Arizona, has already pled guilty and is not one of the four in the current trial.) These and other equivocations by the government are grounds for dismissal or mistrial, defense lawyers say. More questions around the government’s conduct during the impoundment, as well as what information they may be withholding related to this case, will continue to plague prosecutors in weeks to come.